We pick you up at your hotel in Cusco at 1pm (13h00) to journey to the main square of Cusco (Plaza de Armas) for a visit to the 17th-century Cusco Cathedral Basilica of the Assumption of the Virgin. Then, we travel towards the mountains of the Sacred Valley, stopping briefly at the archaeological site of Tambomachay to discover the source of a natural spring formerly worshiped by the Incas. Continue to the atmospheric inca ruins of Qengo and discover a labyrinth with a sacrificial altar at its center. 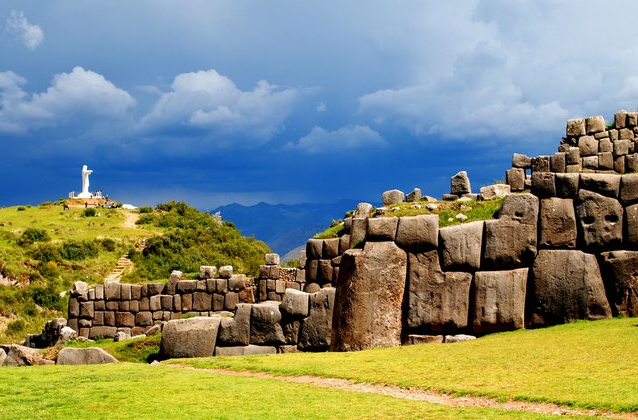 Marvel at the spiraling staircases and secret channels said to have been the site of Inca rituals. .
Next, visit the archaeological site of Sacsayhuaman. Get panoramic vistas of Cusco before taking a look at the site's colossal stones, with intricate carvings depicting pumas, snakes and condors among images that represent the 3 Incan worlds. Go to the majestic Tower of Puca Pucara, where the imposing fortress is complete with impressive aqueducts, springs and waterways. Then, journey back to Cusco and get dropped off at the main square where you can easily get to your hotel. The Cusco City Tour + 4 Inca Sites is rated EASY. However, it is important to feel comfortable walking for extended periods of time 20 minutes at a time approximately. The Cusco City Tour + 4 Inca Sites departs daily and it is available year round. The months of January, February and March are in the wet season, please bring a good rain jacket and waterproof your belongings.